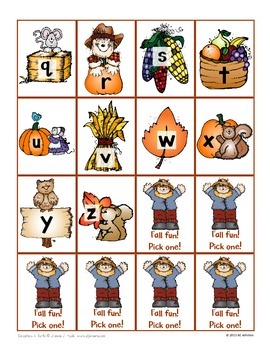 This Fall Alphabet bingo contains pictures related to the fall (no Halloween pictures are included),targeting the alphabet. 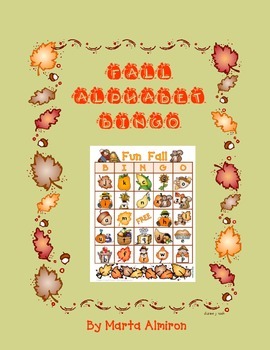 Each bingo card has 25 squares (24 for letters and one free space). 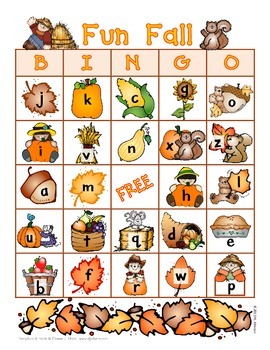 - 6 different bingo cards with lower case letters. - 6 different bingo cards with upper case letters. - Calling cards for both, upper and lower case letters. Graphics &/or fonts copyright Dianne J. Hook.